Abrasive Flow Machining in Anaheim. 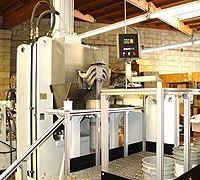 Polishing: Even the most complex shapes of metal parts and the most convoluted of internal passages can be smoothed evenly with abrasive flow machining in Anaheim. Our process is sensitive enough for even the most delicate honing, enhancing the finish without exceeding the blueprint specs. Geometry Optimization: AFM can be used as an aftermarket improvement on engine parts like manifolds, turbines, pumps, and hydraulic parts to optimize flow through the passages without affecting volume. AFM is also very useful for resizing precision dies. Deburring: Burrs of any size can alter flow or otherwise detract from highly precise processes. They are especially problematic for food and medical applications because they can harbor bacteria. With AFM, burrs can be removed without risk of damage or contamination to the passages in the part. The polymer media will carry them totally away. If you have any metal parts that could benefit from abrasive flow machining in Anaheim, please contact us today to learn more about our process and get a quote on your job.